Now is the season for pomegranates. All over the East End, I have spotted them gleaming in enticing piles upon barrows and Leila’s Shop in Calvert Avenue has a particularly magnificent display of glossy red Spanish ones. Only a few years ago, these fruit were unfamiliar in this country and I do remember the first time I bought a pomegranate and set it on a shelf, just to admire it. My father used to tell me that you could eat a pomegranate with a pin, which was an entirely mysterious notion. Yet it was not of any consequence, because I did not intend to eat my pomegranate but simply enjoy its intriguing architectural form, reminiscent of a mosque or the onion dome of an orthodox church and topped with a crown as a flourish. This was an exotic fruit that evoked another world, ancient and far away. As months passed, my pomegranate upon the shelf would dry out and wither, becoming hard and leathery as it shrank and shrivelled like the carcass of a dead creature. A couple of times, I even ventured eating one when my rations were getting low and I was hungry for novelty. It was always a disappointing experience, tearing at the skin haphazardly and struggling to separate the fruit from the pithy fibre. Eventually, I stopped buying pomegranates, content to admire them from afar and satiate my appetite for autumn fruit by munching my way through crates of apples. 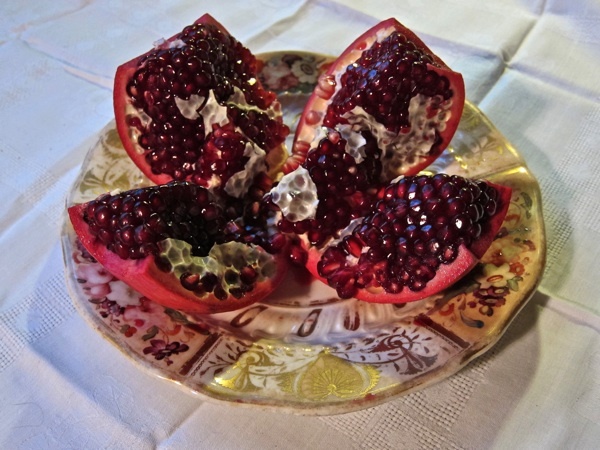 Then, last year, Leila McAlister showed me the traditional method to cut and eat a pomegranate – and thus a shameful gap in my education was filled, bringing these alluring fruit to fore of my consciousness again. It is a simple yet ingenious technique of three steps. First, you cut a circle through the skin around the top of the fruit and lever it off. This reveals the lines that naturally divide the inner fruit into segments, like those of an orange. Secondly, you make between four and eight vertical cuts following these lines. Thirdly, you prise the fruit open, like some magic box or ornate medieval casket, to reveal the glistening trove of rubies inside, attached to segments radiating like the rays of a star. Once this simple exercise is achieved, it is easy to remove the yellow pith and eat the tangy fruit that is appealingly sharp and sweet at the same time, with a compelling strong aftertaste. All these years, I admired the architecture of pomegranates without fully appreciating the beauty of the structure that is within. Looking at the pomegranate displayed thus, I can imagine how you might choose to eat it one jewel at a time with a pin. It made me wonder where my father should have acquired this curious idea about a fruit which was rare in this country in his time and then I recalled that he had spent World War II in the Middle East as a youthful recruit, sent there from Devon at the age of nineteen. Looking at the fruit opened, I realised I was seeing something he had seen on his travels so many years ago and now, more than ten years after he died, I was seeing it for the first time. How magical this fruit must have seemed to him when he was so young and far away from home for the first time. They call the pomegranate ‘the fruit of the dead’ and, in Greek mythology, Persephone was condemned to the underworld because of the pomegranate seeds that she ate yet, paradoxically, it was the fabled pomegranate which brought my youthful father back to me when he had almost slipped from my mind. Now, thanks to this elegant method, I can enjoy pomegranates each year at this time and think of him. First slice off the top, by running a sharp knife around the fruit, cutting through the skin and then levering off the lid. Secondly, make radiating vertical cuts through the skin following the divisions visible within the fruit – between four and eight cuts. 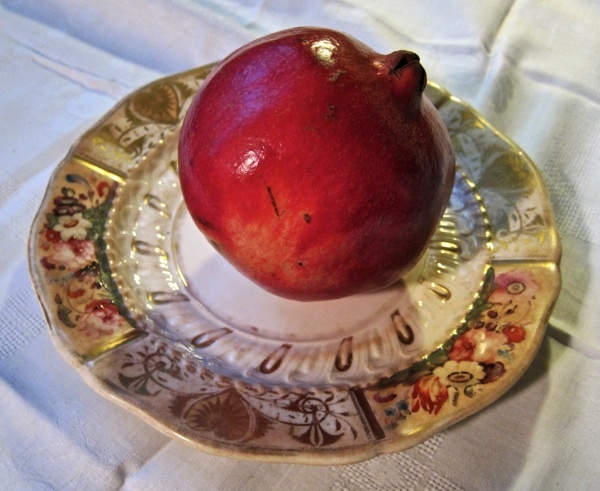 Thirdly, split open the pomegranate to create a shape like a flower and peel away the pith. Pomegranates make me think of my late granny. When I was a child in the 60s she would give me half a pomegranate and a teaspoon to eat it with, I can remember sucking the fruit from the seeds. I never understood how you could get such an exotic fruit in Scotland, but all the local greengrocers sold them. They were a big feature when I was on holiday in Malta last week – the fresh fruit section at our hotel buffet had them every day and all the fruit stall holders sold them. I love the delicate fragrance of the juice, it just reminds me of my lovely but very strict granny. You didn’t mess with her, she was a formidable Victorian lady and would hit you with a wooden spoon for being naughty! 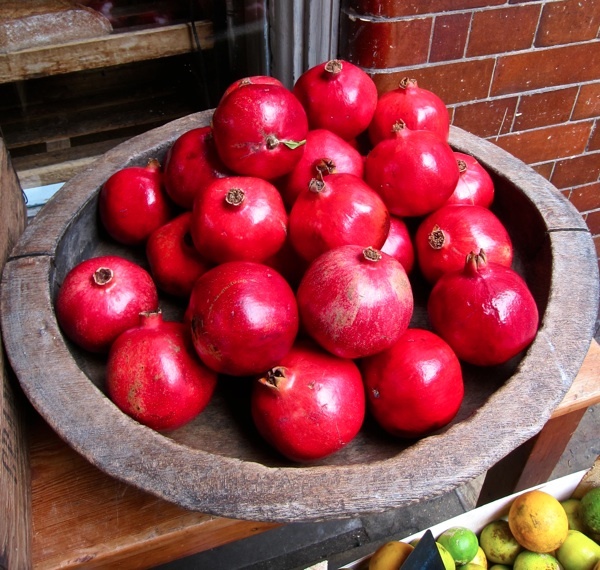 How interesting to learn that you only just recently have had available pomegranates in the London fruit stalls! I grew up eating them and loving them as a child in Toronto back in the mid 60′s and onward. Thanks for the tip on opening them! I have always wore an old t-shirt and just cut them in half and then eargerly scraped the gem-like ruby seeds out with a spoon, peeling away the pith. Enjoy your new delicacy. 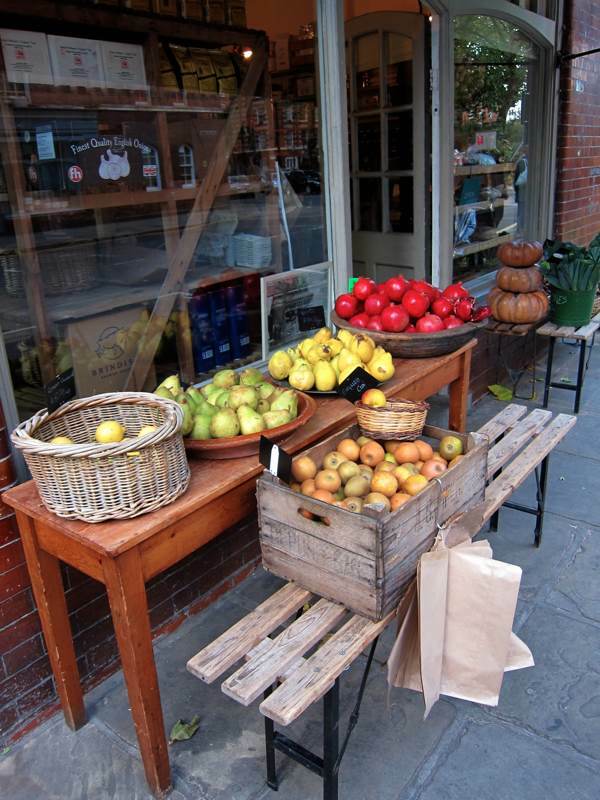 I have always loved seeing them arrive in the markets, adorning the fruit displays. What a nice post! 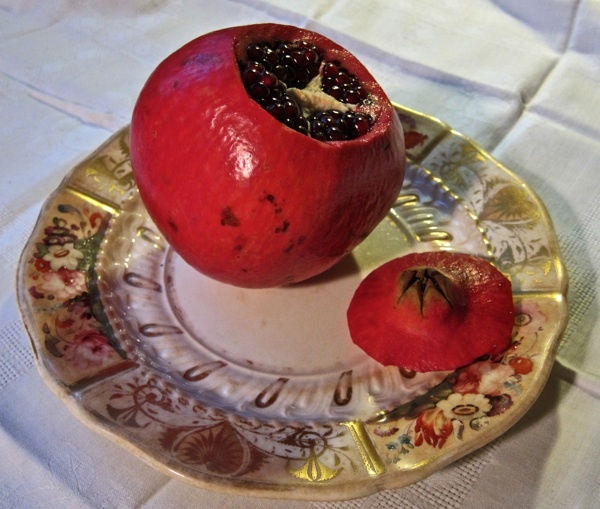 I love pomegranates and was taught a different but equally effective and really easy way to release the gorgeous seeds. You roll the fruit a few times on a surface to release the seeds, cut the fruit in half across so the little crown is on the side, hold half in your hand face down over a large bowl, then with a wooden spoon tap the fruit and all the seeds come tumbling out. In Egypt, we add a few drops of rose water on top. The pomegranate is one of my favourite fruit. I actually named my business Pomegranate too! My mother also used to say you had to eat them with a pin. I am going to buy a pomegranate just to practise opening it. 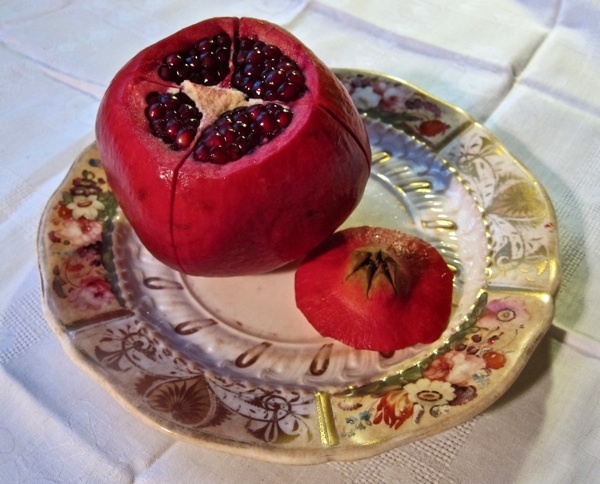 What a nice subject to concentrate on – there IS something very mysterious and beguiling about pomegranates. My mum told me you ate them with a pin too. It sounds a very exotic way to eat, like peeling grapes. Love the pomegranate costumes in the video. Words sweet and tangy as a pomegranate, accompanied by garnet glowing photographs. And now I know how to cut the sides without just guessing at where! You might well have created a run on pomegranates today, what a seductive post! I’m off to get my Spanish pomegranates and forget the rain. I was taught to eat Pomegrantes with a pin. Then we would put a small candle in the pith shell that was left to use as an ornament to weird of Ghosties at Halloween. Maybe it was a wartine thing. Memories re-ignited. Once a week when they were available my brother and I were given a pomegranate. I remember my father teaching me to eat them with a pin at a very young age. Thank you. I have lived all my life in the north east corner of Hampshire and have always been able to buy pomegranates . When a small child recovering from a cold, my Mother would always buy me one to eat with a pin, kept me amused for hours; which was probably the whole point of the exercise. I am still not sure whether to eat the pips or not. How interesting to see how it should be done. I was taught to eat a pomegranate with a pin as a child in Pakistan in the late 1940′s. Your way is so much more elegant, can’t wait to give it a try. When I was a little girl growing up in West Philadelphiain the 60′s, I would receive a pomegranate every year in September in the first weeks of returning to school from my Mom. She called them “Chinese Apples” and they were thought to bring luck. I loved tearing them apart and because I went to Catholic School always thought of the blood of Christ when I ate them. I have loved their tangy taste and beautiful deep red all my life. Pomegranates have always made me think of being a young girl. I remember having them regularly as a pre-bedtime treat in South London in the early 70s – they were my favourite fruit by miles, such fun to eat. We’re an ordinary working-class family and I very much doubt my mum shopped anywhere fancy to get them, so they must have been more common then you think! Like some of your other readers I too was taught to eat a pomegranate with a pin. This was in the early 50s in London and until I read this article, always thought this was the correct way to eat them. Sometimes I’ve even avoided buying them because I couldn’t be doing with the hassle of picking at each seed with a pin. Now I know better! It’s much easier Leila’s way. Off to buy some today! I too was told by my father (a wartime child) that pomegranates were eaten with a pin. I never enjoyed eating one seed at a time I must confess. Whelks were also eaten that way; I enjoyed those even less. How wonderful to be finally shown how to access the spoils of a pomegranate properly! 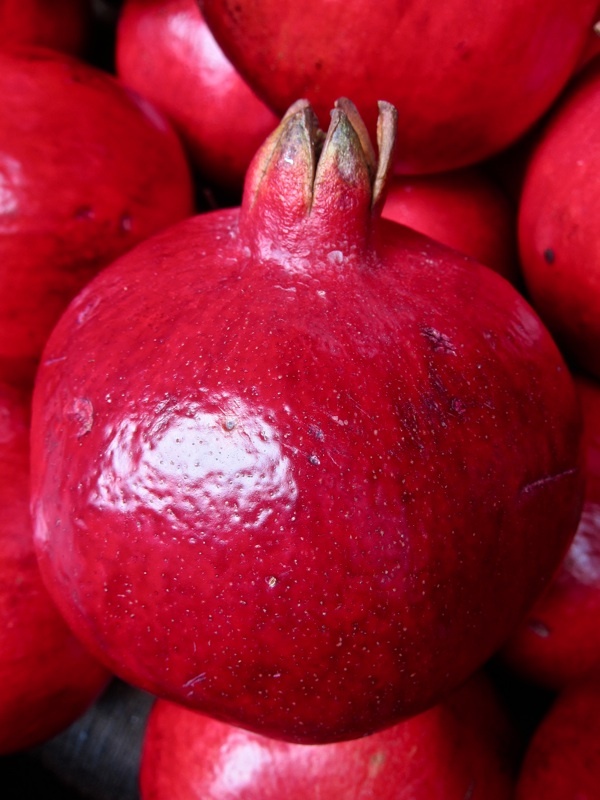 I have been told that pomegranate is derived from ‘pound garnet’. Does anyone remember the ones with parrot labels? They were the best! i’ve just been to the day of the dead celebrations in los angeles and i was surprised to see a street vendor on the sidewalk outside the cemetery selling pomegranate seeds liberated from their husk in a deep bin to be purchased loose like popcorn! you learn something new every day, don’t you? and i’m with nicole – cutting them open and tapping them out with a wooden spoon is very easy and satisfying (and less messy!) of course it was martha stewart who taught many of us americans how to do that! What a beautiful post. Both words and pictures, exquisite. I am going to buy one tomorrow and try your eating method. Love the bit about your dad. Love the pictures haven’ t eaten a whole one in years but remember as kids in the 50s we would dig out those lovely gems and then see how far we could spit the seeds, the big girls told us we should not eat the seeds because we would have appendicitis if we did!!!!!!! I’m surprised you’d missed out on pomegranates – they’ve been around in this country a long time. The pomegranate was the emblem of Katherine of Aragon, Henry VIII’s first wife and can be seen on various heraldic carvings. They were stuffed with herbs and held to their noses by the nobility to ward of the plague and the general stench of the city streets in medieval and Tudor times. I ate half a pomegranate this morning, juicy yet not too sweet. I grew up in Beirut where pomegranate are used in quite a few dips and dressing. Lebanon had a railway system which is now derelict, you can still find a pomegranate tree in every station. Last saturday I planted a pomegranate tree in a friend ‘s garden. I also used to eat a pomegranite with a pin as a child in Birmingham in the 50′s. It must have been quite an exotic fruit in the UK in those days. A lovely post. It is nice to take a look at the little things in life and see where they take you. My first experience of this fruit happened when the old lady who lived next to my mother in law picked one off her tree for me to sample. I suppose I must have asked what they were and Maltese are always eager to let you into their lives. When I was growing up in the 50′s & 60′s you could always buy pomegranates at the greengrocers around Christmas time. Our Mum used to give one to me and my brother on Christmas Day – it was cut in half and we had one half each; we were then given a pin (none of that Health and Safety nonsense in those days!) and told to take each ruby seed out with the pin and eat it it. We found out years later that this was a ploy to keep us quiet for a couple of hours allowing Mum to get on and cook our Christmas lunch! Lovely memories.